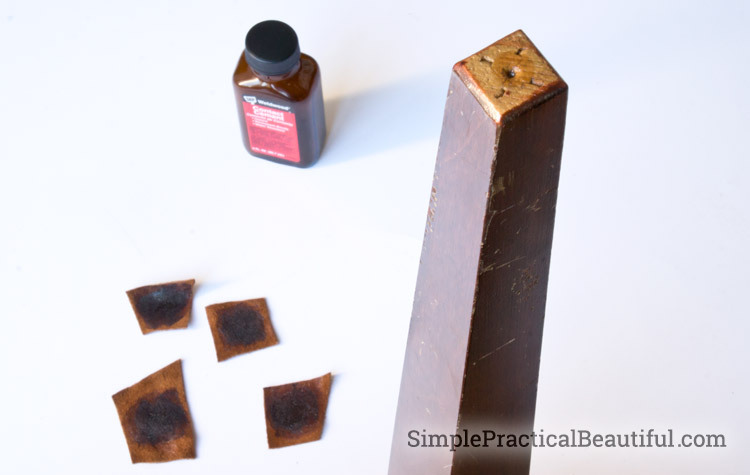 A simple and effective way to make your own leather furniture pads and prevent scratches on wood floors. I love our beautiful hardwood floors. They were the first thing I fell in love with the first time I walked into our house when we were looking to buy it. But, as beautiful as they are, they take a lot more maintenance than carpet to keep them looking good. I am constantly trying to prevent scratches so they keep their shiny, clean appearance. Furniture pads help a lot. 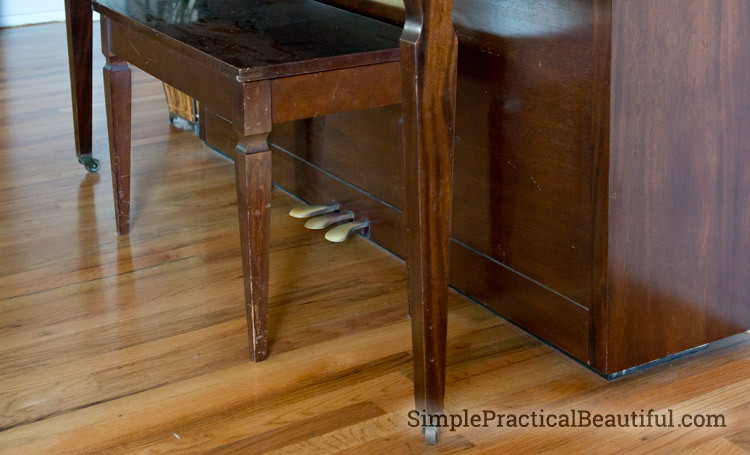 Furniture legs are the biggest culprit in scratching my wood floors, especially our piano bench. 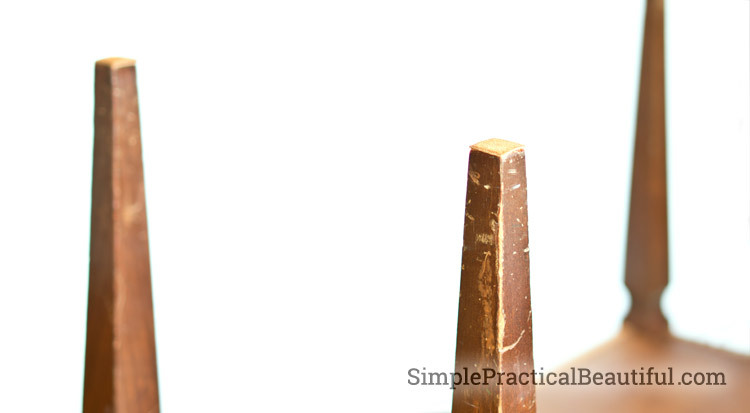 Every time my daughters practice playing the piano (which I love to listen to), I cringe because I know the felt pads are not enough to protect the floors. The sticky felt pad I put on everything when we first moved in just aren’t working. They move and slide off, and they collect dust bunnies and fuzz like crazy. I found the solution on Houzz.com: custom leather pads attached with contact cement. The leather looks nice and is big enough to protect the floor, while the contact cement keeps everything permanently in place. First, I removed the old, pathetic felt furniture pads. Most of the pads were gone, but I had to scrape some of the glue off with a razor. I had an old scrap piece of sueded leather, from making a Sorting Hat. And I bought some Dap Weldwood contact cement on Amazon. 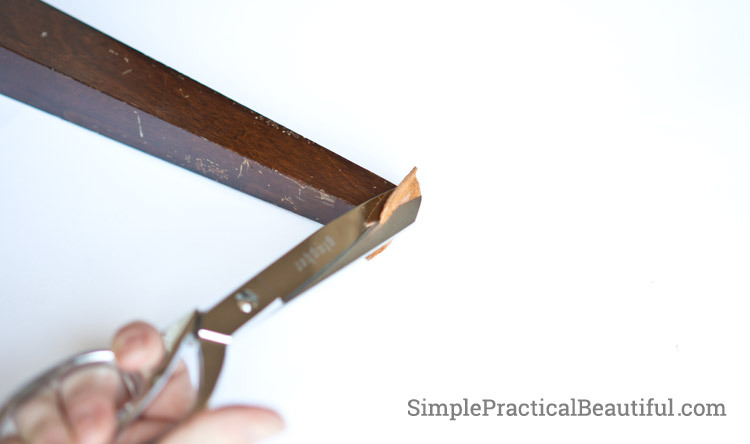 I cut the leather into squares that are a little larger than the piano bench feet. The excess will be cut off later. I put contact cement on both the leather and the 4 feet of the bench, then waited at least 15 minutes (but not more than an hour). That lets the contact cement react and adhere the best. I pressed the leather onto the feet, and let the bench sit for a while (actually, for several days until I got back to it). This was to make sure the contact cement was permanent and completely adhered before I messed with it. 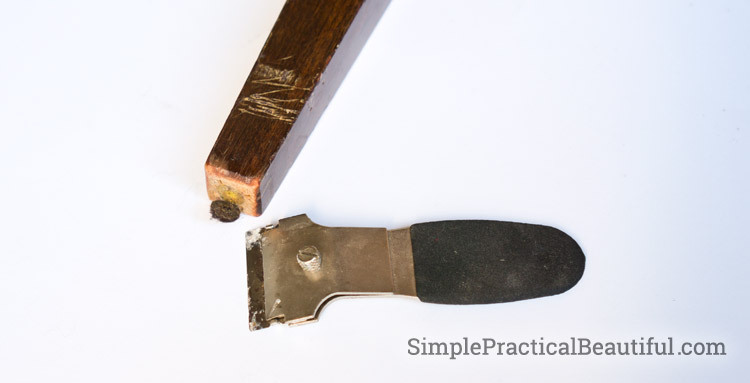 Next, I cut the leather down to the exact size of the foot of the piano bench, so that it doesn’t show. To make the bench look a little nicer for its final pictures, I rubbed it with Howards Restor-A-Finish. 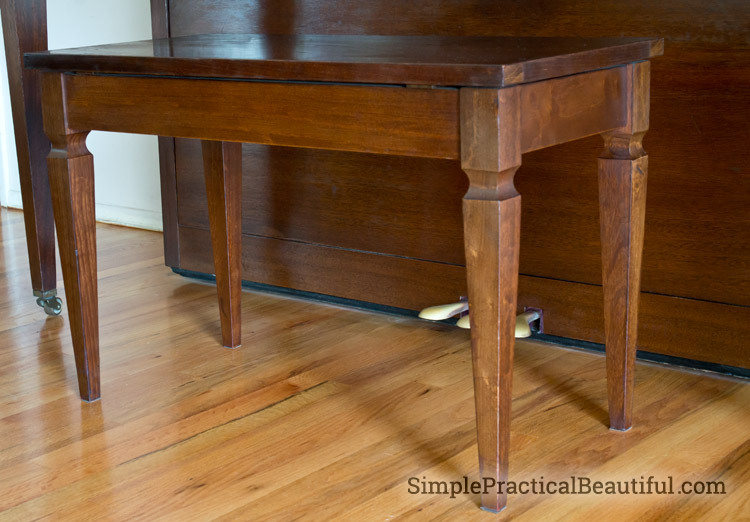 I put Restor-A-Finish on all of my old, scratched wood furniture every few years. 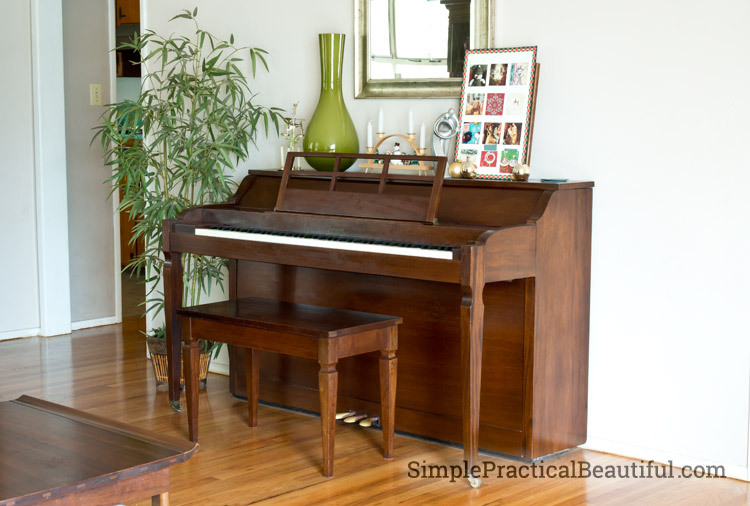 It’s makes wood look like new again without all the work and hassle of refinishing the wood, but it only last for a few years. One day I will actually need to refinish this bench, but not while were still going through piano lessons. My leather furniture pads protect my wood floor wonderfully, and they stay in place. Now I can listen to piano practice without any cringing. 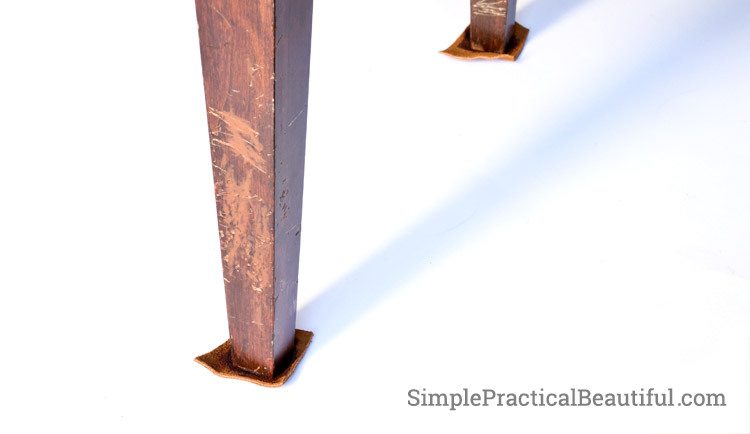 The post DIY Leather Furniture Pads appeared first on SimpePracticalBeautiful.com. Rebecca, this is awesome!! 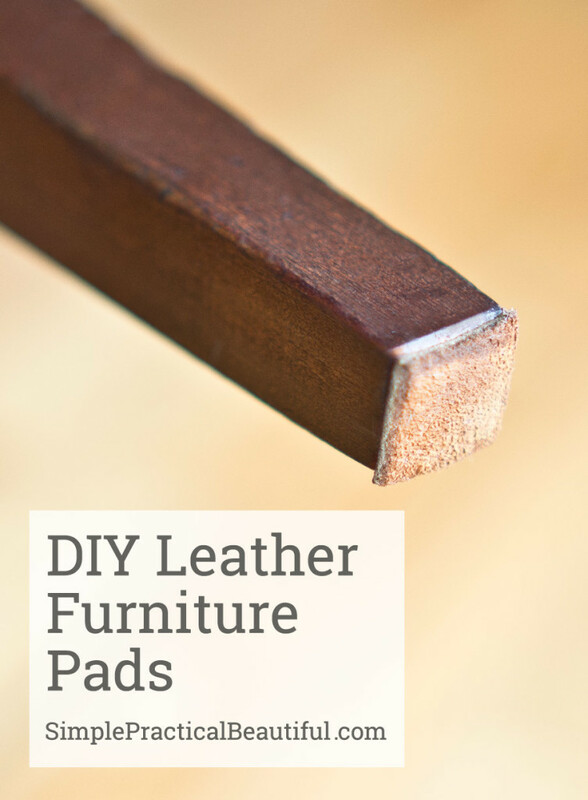 Thanks for the tutorial on adding these leather pads to furniture!! We just finished up refinishing the hardwood floors in my kiddos’ room, and we’re getting ready to move the furniture back in a few days, so this is quite timely. Thanks!! Thanks, Keri. I’m glad you can use it. 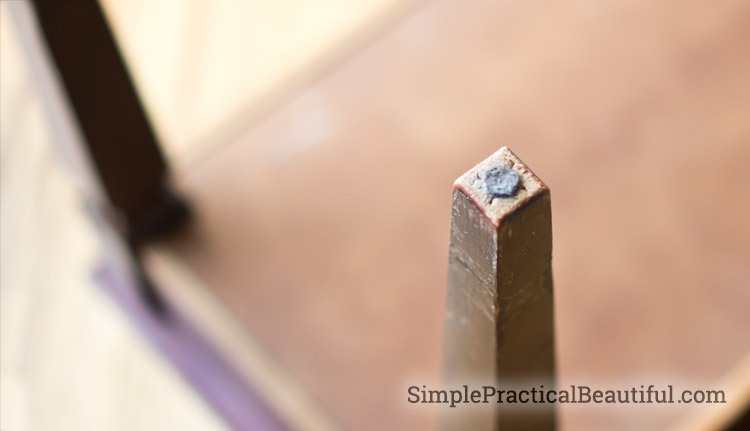 I absolutely love our wood floors, but they sure are a lot more work and care than carpet! Oh my goodness! I’m totally going to do this! I keep buying the felt pads over and over again because they never stay on but I need to save my floors. What a great idea! Thanks for sharing. Thanks Megan. These leather pads look much nicer and have worked so much better than the felt pads. Definitely worth the few minutes it to make them. This is a smart idea, Rebecca! I know all about the failed solution of the felt pads. Mine collect lots of hair as well as dust bunnies because I’ve got teen girls int he house who are always fussing with their hair. Next time I see some suede or leather I’m going to try this. Yes! The hair!! That was actually the reason I started researching how to make these furniture pads. Those little felt pads would collect so much hair and fuzz, and it was gross to have to pull it off. The leather doesn’t attract anything, so I can just dustmop and get all the fuzz. I bought some scrap leather from my local shoe repair for $5 and just did all of our stools at our island and all of the chairs at our dining table. It was so easy. The hardest part is removing the adhesive from all the felt pads that have been used previously; I used a razor and acetone to remove the sticky residue. I am extremely happy with the results. Thank you for your post of this solution. I wish I had seen it years ago! Debbie, you just made my day! Thank you. I’m so glad my post helped you and it was easy. I love having permanent leather pads instead of those awful sticky felt ones too. Is color pigment transfer from the leather a concern? I haven’t had a problem with any color coming from the leather. If you had wood floors, it shouldn’t matter. 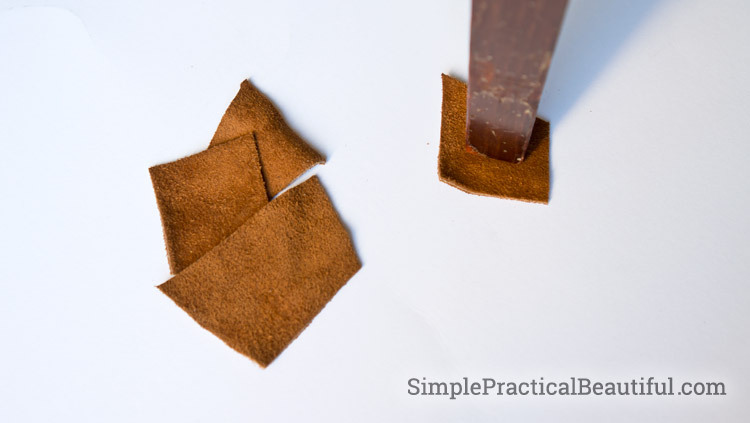 If your furniture is on carpet, you may want to test a small piece of the leather first by getting it wet and blotting it on a paper towel to see if the color transfers. Although, if your furniture is on carpet, you don’t really need furniture pads.